India may choose the Russian "Storm"
Indian aircraft carriers INS Viraat and INS Vikramaditya at the International Fleet Review 2016. With a tender due shortly for the Indian Navy’s acquisition of a nuclear-powered aircraft carrier, the Russian ‘Storm’ (nuclear aircraft carrier project 23000E) appears the leading contender, even with US and French competitors. The design of the nuclear aircraft carrier project 23000E "Storm" could form the base to build a ship of a similar class for the Indian Navy. This decision will be made during a forthcoming tender process in Delhi. 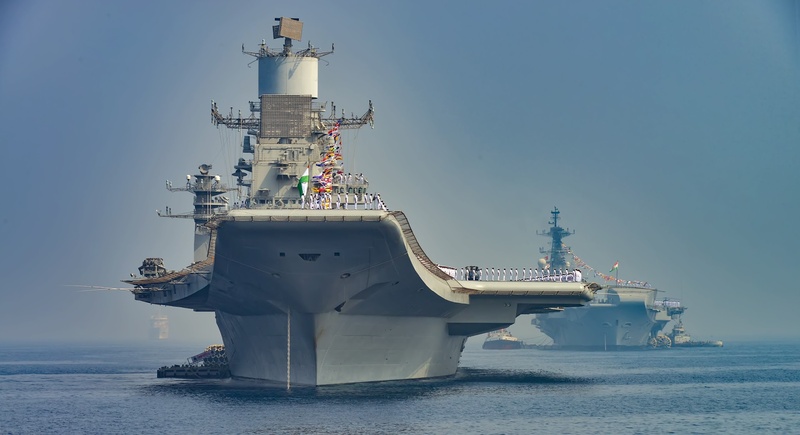 The Indian Navy seeks to get an aircraft carrier with a displacement of 65 thousand tons, one that is 300 m in length, and 70 m wide, equipped with a nuclear power plant. And although the United States and France are participating in the technology race, according to "Izvestia", the Russian proposal is leading the race. The Project USS 23000E aircraft carrier (“Storm" code) is still in its model form. The concept of the ship was developed in the Krylovsky research centre jointly with the Nevsky product engineering company. It was first displayed at the "Army-2015" exhibition in the framework of the Navy exposition. According to the sailors, the ship has a displacement of 100 tons, is 300 m in length, 40 m in width and can accommodate a crew of four to five thousand people to perform combat missions at sea, of up to 6-7 points. The aircraft wing craft will contain up to 100 airborne devices of various classes. There are two runways on the deck; a "big" one and a "smaller" one. One of them is a "classic" one with a "springboard", the second one is a flat one, like on American aircraft carriers. There are also aircraft and helicopters of at least five different types that are attached to the stern and the bow. These are carrier-based fighters T-50, MiG-29K / KUB, long-range radar detection aircrafts, AEW (AWACS), presumably the Yak-44E – as it was explained to “Izvestia", they are expected to rise and fly in the air along the shorter deck using electromagnetic catapults, as well as helicopters. While developing the preliminary design, the Krylovsky centre proposed an original body for this ship; the best from the point of view of resistance, said Valery Polovinkin, Advisor to the General Director of FSUE, "Krylov State Research Centre." Its form and its deck are designed to have the best possible aircraft fleet with a limited displacement and major dimensions. The designer said that, according to preliminary estimates, the resistance to the movement of the ship will be about 30% less than the traditional contour of the body. This aircraft carrier allows the latest generation of aircrafts and helicopters to take off even during a storm. Both trampolines and catapults are provided for airplanes. Under the flight deck and in the optimized superstructures there are power plants and nuclear power plants of the latest combination. The Russian project fits well with the concept of the Indian Prime Minister Narendra Modi’s "Make in India," naval analyst Alexander Mozgovoy informed the "News". The purpose of the programme is to transform India into an industrial country, increasing the share of industry in the GDP from 15 to 25%, with the help of government assistance programmes. At present Moscow is the only partner which is ready to transfer to Delhi both the weapons and technology systems, and the technology for their development and production. Mozgovoy recalls that the United States has never transferred its own developments to anyone. Russia and India already have a joint carrier design project, he said. Last year, an aircraft carrier was launched on the Cochin shipyard, built according to the 71 "Vikrant" design, developed with the help of the Russian Nevsky Design Bureau, as well as the Italian shipbuilding association Fincantieri. The ship’s displacement is 37.5 tons, length - 262 m and the maximum width (on the flight deck) is 60 m. The gas turbine power plant of 80 MW is to provide a travel speed of 28 knots. The ship uses the STOBAR circuit (Short Take-Off But Arrested Recovery), providing a springboard takeoff and landing on the corner deck via arresting gear. The structure of its air group will include up to 14 MiG-29K / KUB and Tejas aircrafts, and around 10 helicopters. According to the Indian military estimates, 50% of "Vikrant’s" technical equipment and 30% of its arms were designed by Indian experts. The aviation systems and technical equipment of the ship, according to the deputy director of "Rosoboronexport" Victor Komardina, were designed and manufactured in Russia. According to Kozyulin, it is this combination of factors that speak in favour of the Russian project. The "Storm" deck is designed for the deployment of the MiG-29K. There are likely to be Russian-Indian fighter of the 5th generation FGFA in future. A deck version of the aircraft is also likely to be built, with the Russian Defence Ministry even announcing the project. It is difficult to assume that, having invested $ 25 billion in a joint project, New Delhi will resist the temptation to deploy the most modern machines on the deck. The article is abridged. Read the full version in Russian in Izvestia.